An outbreak of E. coli food poisoning linked to Chipotle restaurants continues to grow in Washington, with 29 cases. In Oregon, the count dropped to 10, after laboratory results were confirmed. 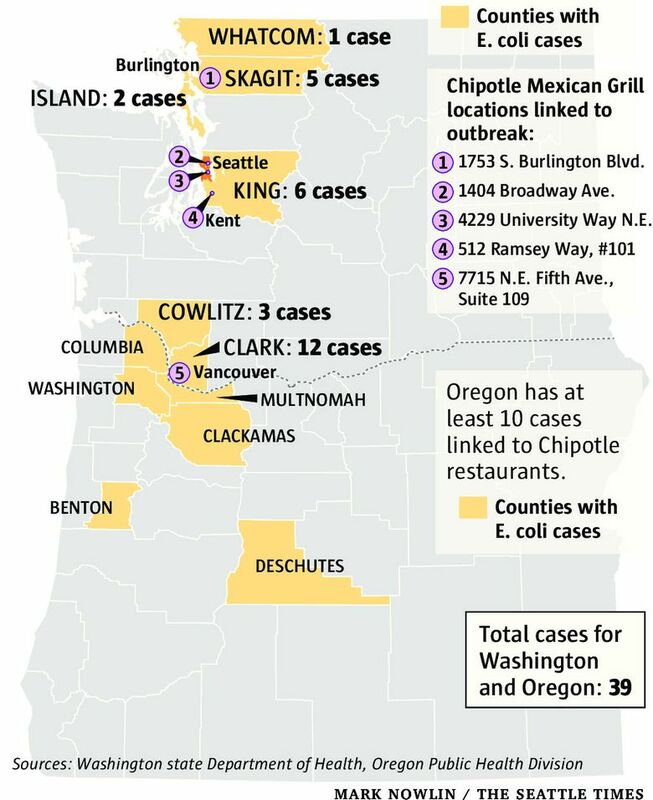 The number of E. coli food-poisoning cases linked to Chipotle restaurants in the Northwest continues to rise, with 29 cases in Washington. The count dropped from 12 to 10, in Oregon, however, for a total of 39 confirmed in the outbreak, health officials reported Wednesday. Fourteen people have been hospitalized; no deaths have been reported. Forty-three restaurants operated by the Mexican fast-food chain remain closed in the two states as regional health officials scramble to identify the genetic fingerprint of specific cases and federal officials designate outbreak-response teams to help. So far, many of the cases appear to be caused by E. coli O26, a strain that produces Shiga toxins that can cause serious illness. Tests from eight ill people — five from Washington and three from Oregon — indicate they all were infected by Shiga toxin-producing E. coli O26 width the same DNA fingerprint, according to a report posted late Wednesday by the Centers for Disease Control and Prevention (CDC). More samples will be tested. Health officials suspect fresh produce is the culprit, but test results of food from the restaurant sites — and the supply chain — are pending. In Washington, cases include 12 in Clark County, six in King County, five in Skagit County, three in Cowlitz County, two in Island County and one in Whatcom County. Victims range in age from 1 to 67. In Oregon, new lab results excluded three people originally thought to be part of the outbreak and confirmed one suspected case, for a total drop of two. Cases there range in age from 11 to 61. More cases could be reported, with a time frame that now dates to Oct. 1. 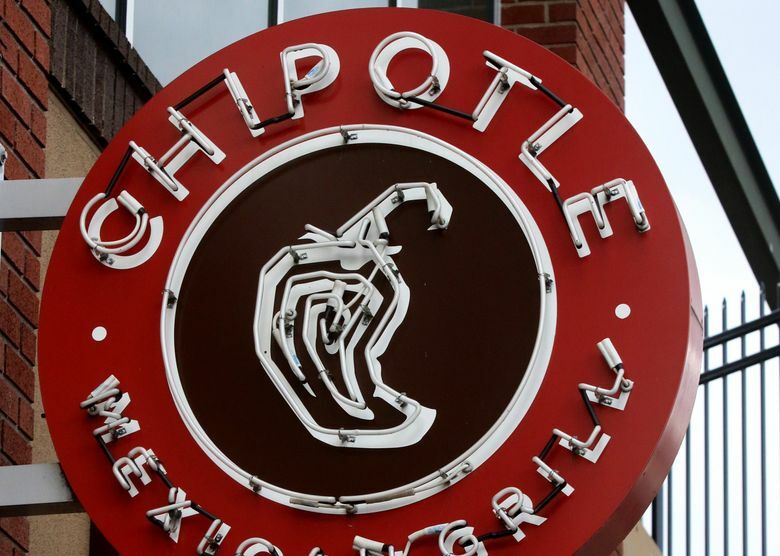 Health officials advise anyone with intestinal symptoms who ate at a Chipotle in Washington or Oregon to see a health-care provider. The federal Food and Drug Administration (FDA) has assigned a response team to assist with the probe from agency headquarters, in Washington, D.C., officials said. Investigators with the CDC are also helping from Atlanta. Chipotle will conduct deep-cleaning and environmental testing in its restaurants and distribution centers, along with testing ingredients before resupplying, the firm said in a news release. It wasn’t clear whether the company would release those test results. In addition, Chipotle has hired food-safety consulting firms to help identify and halt the outbreak, including IEH Laboratories and Consulting Group in Seattle, widely regarded as a top firm. “The safety of our customers and integrity of our food supply has always been our highest priority,” Chipotle Mexican Grill chairman and co-chief executive Steve Ellis said in a statement. 7715 N.E. Fifth Ave., Suite 109, Vancouver, Wash.